Ya know how our favorite Beats were not exactly role-model parents? How there aren’t a lot of heart-warming parent-child stories in Beatlandia? Carolyn Cassady and her son John were sumpthin else. Honestly I’m tearing up just now picturing them together. It was the greatest thing. They loved each other as much as two people can. And they were like a comedy duo, like a Burns & Allen, or Dashiell Hammett’s Thin Man couple, wise-crackin’ all the time — so in synch you’d think they’d been jamming since birth! They had each other’s rhythms and thoughts DOWN — and could just play the other — it was amazing — like two instruments trading off in a band. There could be a room fulla people and they’d be in different clusters and they’d still somehow be hearing each other and one would say something and the other would laugh from 10 feet away. And they could tell the most risqué jokes or one-liners that would make me blush — and the two of them would just roar! There were so many nights in hotel rooms or restaurants that we’d all be talking and laughing so loud there were noise complaints. And this was never ending. They didn’t even have to be on the same continent and they could make each other laugh — just by hearing the other’s voice in their head. 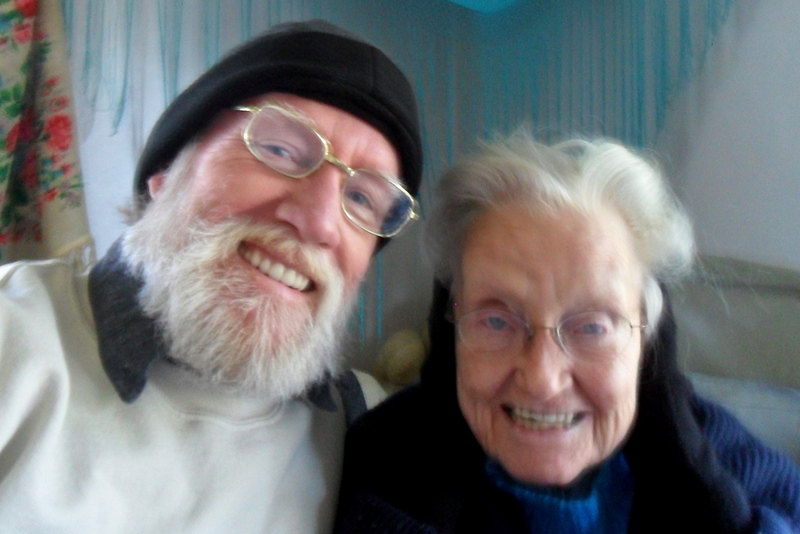 When I mention in my tribute to Carolyn about her inspiring me with my own mom, it was really seeing them together that exploded my framework of what a parent-child relationship could be. They were like two little kids when they were together. Look at that picture above. I bet that’s the exact same expression of giddy silly playful joy Carolyn had when she was 4 years old. And they could also be like two complaining old fogies on a swing on the front porch grousing about how things ain’t like they used to be — then crack each other up at the irony. What I’m saying is — there was at least one tremendous parent-child relationship up on Mount Rushmore in South Beatlandia. And those two were living it. For one of our many great adventures together, check out this one in Jack’s Long Island — The Northport Report. Or for a video tribute to Carolyn on the occasion of her Memorial — check this out. Or for a sweet ode I wrote for Carolyn several cycles ago you can riff the Carolyn Birthday Poem. Or for the tribute to Carolyn upon her sad passing — check out my tribute to her. Or here’s another poem about CC as living history from when I was living with her — The Royal Woods of Cassady County. Thanks so much brother Bri. What a heartfelt, beautifully written and observed piece …. so utterly moving and resonant. As we say in Brazil: “Muito obrigado”. Thank you so much for this …. I only spent one day in the company of John and Carolyn together but this brings that magic afternoon back. And he answers the question: Can one be a Beat acolyte and still be a great parent? An emphatic, YES!! Carolyn, and I believe the same for Gary Snyder, seemed to remain above the fray in the Beat canonization and myth making. They actually lived separate lives from it; to their credit. It’s inspiring, it’s beautiful, it’s sweet… Thanks for this, Brian. Really super! Thanks for sharing! A mom could only hope for a son so in sync! XO to you and your mom, Brian. This is beautiful, Brian. I can just picture it … knowing John and all … and his sense of humor. Thanks for sharing this. Once again Brian, your take on the human bond, is spot on… you write with ease the things we all sees! What a gift you have, and what a gift you are – and what a birthday gift you have given to John – Cheers! Reminds me a lot of you and Enid! A wonderful parent-child relationship that I witnessed, even before I met you.